Done! I'll tell you what, it sure feels good to finally have that company done! I should be set for a while on large gun teams, but I'd like to do another 12 at some point. These 12 are good for a GoW battery, but if I wanted to field my eight extra 122mm obr 1938 howitzers as a part of the Reserve Artillery Battalion, I'll need eight more bases. I'll also need some more in the event that I want to field the 57mm anti-tank guns in addition to the artillery, so that's another four bases. Now that I have a process combined with the fact that the guns are already painted, doing 12 more bases shouldn't be a big chore in the future. For now its time for me to sit back, relax, and enjoy the GoW Battery! Still to do are the command bits for the battery, six 45mm obr 1937, and six 45mm obr 1942 anti-tank guns. I'm doing these the same as I've done the artillery. 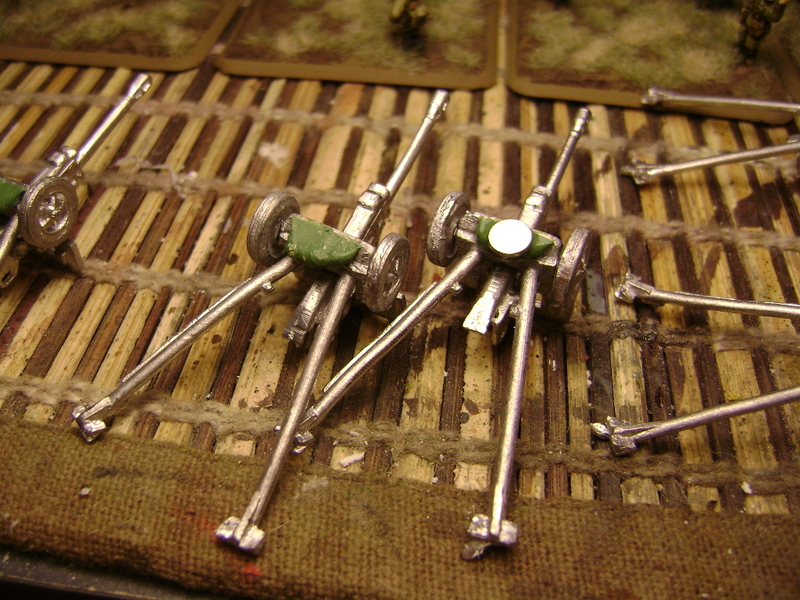 They were a bit tricky to magnetize because they lack a flat surface like the 122mm and the 76mm obr 1936. The ZiS 2 and ZiS 3 guns have the same problem. My solution was to make a flat surface using green-stuff. Anyway, here's some photos of the battery. Thanks for reading! Quick question but how do you paint and flock your bases? I'm looking for a scheme for my Fins and your bases seem to fit the bill well. Sorry for the delay! I missed your question. Better late than never, I suppose! The bases are vinyl spackle/rapid filla for the filler. Then basecoated in a cheap Burnt Umber paint. Highlighted with US Field Drab (VP873) followed by US Tan Earth (VP874). I used Arid Static Grass (GF9) and patches of Winter Dead Grass (also GF9). The little bushes are from Woodland Scenics. Hope that helps! I'll "steal" this idea for my LW Germans I'm doing soon.